I have to admit- I love Fig Newtons. 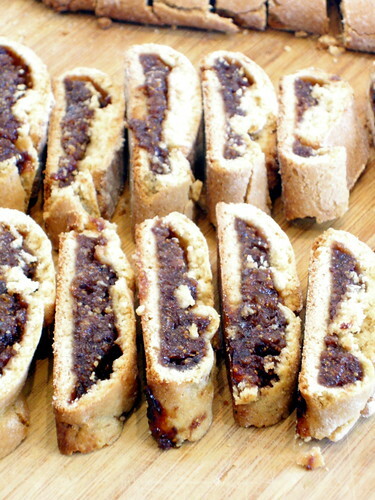 The strange crumbliness of the cookie and the complex sweetness of the fig filling add up to one delicious cookie. Unfortunately, Fig Newtons have numerous ingredients that I cannot even begin to pronounce, and the Organic knock-offs (Fig Newmans) just do not measure up. When I came across this recipe in Room for Dessert, I was excited, to say the least. I was hoping that these cookies would live up to Fig Newtons. I was hoping they would knock Fig Newtons out of the park. In case you were wondering, they definitely did. The only downside to the recipe was its use of a food processor, which is my least favorite kitchen appliance; however, the recipe was relatively straight forward and very easy to follow. I love these cookies. They would be a nice addition to fruit for breakfast, but they really could be an anytime snack. Something about the figs keeps the sweetness from being too overwhelming, even though they are still sweet. I could definitely, definitely eat more than one of these. Trim off and discard the hard stems of figs. Put figs in a saucepan with sugar and lemon zest, cover with water, and bring to a boil. Reduce heat and simmer figs for 30 minutes until tender. When figs are tender, remove from saucepan with a slotted spoon and puree in a food processor. Stir in 1/4 teaspoon vanilla extract and set aside to cool. Cream butter and brown sugar until smooth. Add vanilla and eggs once at a time, beating until eggs are incorporated. Whisk together flour, baking powder, cinnamon, and salt in a separate bowl. Gradually stir dry ingredients into creamed butter mixture. Gather up dough and divide it into four pieces. Shape each piece into a rectangle roughly 3/4-inch thick, wrap the pieces of dough in plastic, and refrigerate for at least 30 minutes. Preheat the oven to 350. Line two baking sheets with parchment paper. On a lightly floured surface, roll out the first piece of dough into a rectangle about 5-by-90inches. 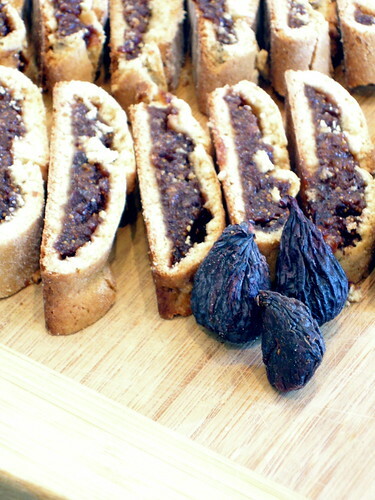 Spread one quarter of fig filling evenly in a lengthwise strip down center of dough. Brush exposed surfaces of dough lightly with water. Fold dough around filling as if folding a letter. Place cookie roll on baking sheet, seam-side down. Pinch ends of roll together to completely enclose filling. 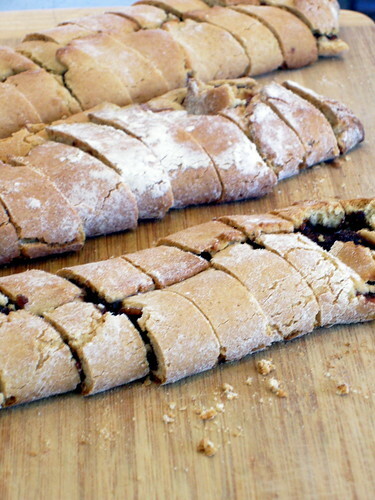 Repeat process with remaining pieces of dough and rest of filling, putting two cookie rolls on each baking sheet. Bake for 20-25 minutes, until dough is a deep golden brown, rotating sheets halfway through. Remove cookie rolls from oven and cool for at least 15 minutes. 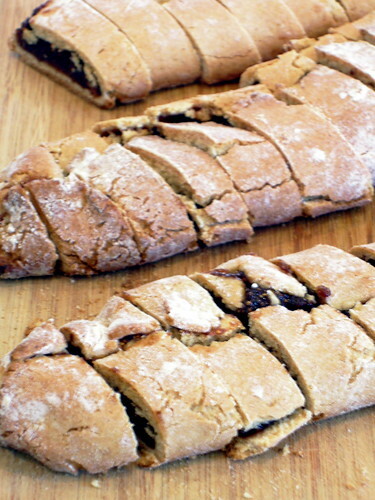 With a sharp serrated knife, slice rolls into 1-inch thick cookies.